Congratulations to Andre Akkari, Winner of Event #43: $1,500 No-Limit Hold’em ($675,117)! Some final tables are boring, bland, quiet and utterly unenjoyable for those on the rail, and from home, watching along. Thankfully for Andre Akkari, his many friends and the mammoth Brazilian-heavy rail that supported him over the previous few days, this tournament will go down as one of the most exciting of all time! 2,857 players took to the felt on Saturday to battle it out in one of the last $1,500 No-Limit Hold'em events of the Summer. Whether you were an online star, a seasoned veteran or someone playing your first tournament, nearly everyone stood at equal chance to finish atop in a few days time. The action flew hard and fast - as is expected in these events - as nearly 2,500 players found themselves on the rail unable to secure a day two berth. As we plowed into the money early on day two, players would jostle and exchange chips freely as they looked to secure a place high on the chip leaderboard. Yueqi Zhu (280th), Thomas Keller (252nd), Erica Schoenberg (237th), Nick Binger (232nd), Tommy Vedes (228th), Doug Carli (223rd), Eric Baldwin (214th), Gavin Griffin (212th), Soi Nguyen (207th), Bernard Lee (161st), David Baker (149th), Kathy Liebert (148th), Joe Cada (144th), Maria Ho (125th), Dwyte Pilgrim (81st), Tim West (60th) and Age Spets (37th) all fell to the rail as thirty-four players survived to the expected final day. Expecting to play through to a winner, no one was ever believing that it would occur, and although we were at a final table after just five hours of play, we all knew it would be a long night. Andre Akkari kick-started the action with a double elimination - one of which included a previous $1,500 No-Limit Hold'em winner in Ray Foley - as we lost Zachary Hall soon after. 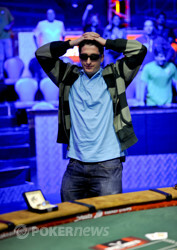 EPT Champion Nicolas Chouity was next out the door, before Scott Sitron followed to leave us with a final four. Three hours later majority day chip leader Jacob Naquin would fall ending the heated rail verbal war between his friends and those following current chip leader Nachman Berlin. Another ninety minutes later we would be heads up with Matthew Carmody quietly waving farewell. With American Berlin up against Brazilian Akkari, it would be Akkari suffering at a slightly better than a two-to-one advantage, but what he lacked in chips, he made up with rail support as over fifty Brazilians (and others) filled the Thunder-Dome sporting football jerseys and waving Brazilian flags while bellowing out chants and cheers as they rallied behind their man. After a little over an hour of heads-up play, the night would be paused Akkari sitting roughly at a three-to-one disadvantage. Play began at a very stagnant rate with it taking several hours before Akkari starting closing the gap between he and Berlin, and as we arrived at the first break, Akkari was trailing by only two-to-one. He slipped back out, but then managed to snag a huge double with his ace-eight against the king-queen of Berlin to bring it back to even before holding with pocket kings to sail out in front. From there it would take just a few more hands to end Berlin's tournament in second place and see the Brazilian awarded his first gold bracelet and $675,117 in prize money. For Akkari, when he looks back at this tournament, he will have the memory of one of the strongest rails in WSOP history there supporting him. From the four hours of play today, to the time spent in the stands yesterday, his friends and supporters rallied behind him as he made a run at the gold. It was no more fitting that when he was awarded the bracelet he held it high above his head directly at the Brazilian crowd before he was given the announcer's microphone to lead a chant that everyone here in the Amazon room had no become so accustomed too. PokerNews would like to congratulate PokerStars Team Pro Brazil member Andre Akkari on securing his first WSOP gold bracelet after playing a tournament that was filled some of the most enjoyable moments that we have ever been a part of during the World Series of Poker. For a player that always seems to always have a smile on his face and never a bad word to say about anyone, this is without doubt a well-deserved accomplishment and one that he will cherish and remember for years to come! 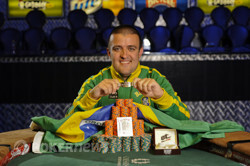 Team PokerStars Pro Andre Akkari captures the bracelet in event 43. Nachman Berlin Eliminated in 2nd Place ($419,173); Andre Akkari Wins! With the action on Nachman Berlin on the button, he moved all in for his remaining 1,920,000 in chips, and after eyeing off his opponent's stack, Andre Akkari made the call. With both players holding formidable heads-up starting hands, it would be Berlin holding the best hand for his second consecutive all in, but that still didn't prevent the Brazilian rail cheering hard to see Akkari come from behind to not only snag the pot, but more importantly the gold bracelet. As the Thunder-Dome echoed with cheers, chants, stomps and claps, the Brazilian cheer squad swayed back-and-forth like if Ronaldinho was lining up for a game winning penalty in extra time at Maracanã Soccer Stadium in Rio de Janeiro. The dealer slowly peeled a flop to surge Akkari into the lead as the crowd erupted further - something that didn't seem at all possible! 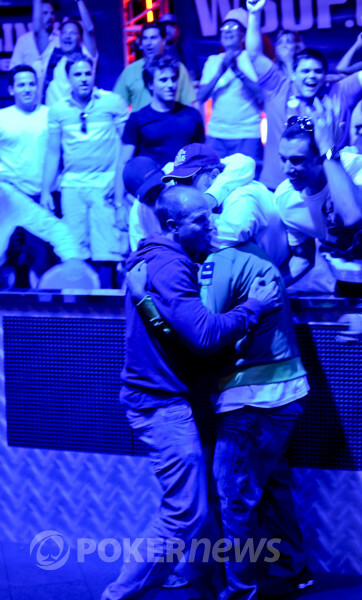 As Akkari paced back-and-forth just in front of his rail, the dealer burned and turned to reveal the tournament ending on the turn as roughly thirty people jumped the railings and surged upon Akkari swamping in a sea of hugs as the dealer completed the river with the . Unfortunately for Berlin, he would have to be content with 2nd place and the $419,173 payday, as Akkari was hoisted onto the shoulders of numerous friends - some of which were fellow pros Gualter Salles, Alexandre Gomes, Felipe Ramos and Maria Mayrinck as Brazil was awarded their second WSOP gold bracelet following Akkari's win here today. From the button, Nachman Berlin moved all in for 1,105,000 and Andre Akkari made the call. With Berlin in the lead, the flop saw him flop the wheel to give him an unbeatable lead in the hand, and only runner-runner outs to a chop with Akkari. The dealer dropped the on the turn, and when the landed on the river, Berlin doubled through to 2,285,000 as Akkari still retains a stranglehold on the heads-up match with a near five-to-one advantage. Nachman Berlin opened to 600,000 from the button only to have Andre Akkari move all in for 5,290,000 from the big. After deliberating for a few moments, Berlin made the call to put Akkari at risk. As Akkari headed over to friend and fellow Team PokerStars Pro Gualter Salles, the dealer dropped a flop to keep Akkari in the lead. The dealer followed with the and to send the Brazilian cheer squad into a massive cheer as Akkari snagged a huge double to over 10.6 million as Berlin was left with a little over 2.2 million in chips. Both players checked a flop to see the land on the turn with Nachman Berlin's 275,000-chip bet being called by Andre Akkari. The river of the was checked through to see Berlin announce a pair of threes, and Akkari a pair of eights, as the Brazilian scooped the pot. The PokerStars Team Pro makes his Brazilian rail go wild. Andre Akkari is mobbed by his supporters after winning the bracelet. Andre Akkari nervously awaits to see if he has Nachman Berlin covered. Andre Akkari is event 43 bracelet champion.